A collaborative daily process of building a centre for the study of self-improvement. In 1258, one of the most extraordinary cultural and scientific experiments came to a sudden and highly destructive end. Mongol raiders, laying siege to Baghdad, set about systematically destroying the incredible archive of research and scholarship that had come to make up the House of Wisdom. Operating for nearly half a millennium, the House of Wisdom was an Islamic research centre devoted to ideas of self-improvement through the arts, sciences, and humanities – where ‘self’ was understood in non-atomistic terms: as culture propagating its own growth and refinement for the good of all. Ideas of self-improvement implicit in the activities of the House of Wisdom are today manifest in different forms. While scholarship is still a cornerstone of knowledge accumulation and dissemination, other non-cerebral activities have become central to our contemporary sense of self-improvement. Physical and psychological wellbeing and social connectivity are seen as fundamental components of today’s individual, no longer defined through modernity’s ideal of ‘well-roundedness’, but ever unfinished in a milieu of urgent specialisation and ‘life-long learning’ for competitive advantage. Taking the House of Wisdom as inspiration, artists Jem Noble (Vancouver/Melbourne) and David Cross (Melbourne) stage a new manifestation of this intellectual hothouse. As a project developed under the auspices of Performing Mobilities, the artists instigate a new House that interrogates what self-improvement can mean in our time. The artists working with an invited group of 15 collaborators/participants will collectively build a temporary House of Wisdom in Melbourne. Through lectures, art making, performances, and critical reflection, House of Wisdom will attempt to build a centre for the study of self-improvement. 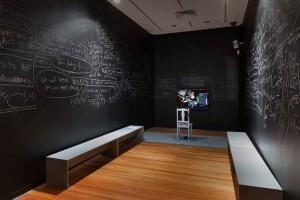 House of Wisdom, Margaret Lawrence Gallery VCA, 2015. Photography: Kay Abode. The House of Wisdom (HoW) — a centre for the study of self-improvement — was facilitated by David Cross and Jem Noble. To say it was ambitious implies there was a goal, thus, ‘audacious’ is more fitting. For many of us working within the HoW, it became clear that there was no telos to aim for. But whether, in its non-linearity and attempted immanence, it was a liberatory process for all who engaged with it, I am unsure. Our daily excavations of second-hand shops for artefacts were telling about the new economy; in particular the corporatising of charity opportunity shops into social enterprises, and the sheer quantities of disowned self-help detritus. Following our morning forages and debriefs, our afternoons alternated between lectures – by Drs. Laura U Marks, Jonathan Lyons, Ika Willis, Geoff Boucher, Peter Hill and filmmaker/ethnographer Ben Russell – and art-making at the Margaret Lawrence Gallery at the VCA. Lyons and Marks shared their knowledge about the Beit al-Hikmeh (House of Wisdom) in Baghdad in the Middle Ages, wherein Arabs preserved and developed philosophical ideas and technologies from ancient Greece, which benefitted and informed scholars of the western Enlightenment era. Also, one of our daily op shop mobilities doubled as a lecture on the construction of the self with Dr. Geoff Boucher. Among the bookshelves and clothes racks at Footscray Savers, HoW members coalesced in critical discussion. Then, in-situ we engaged with Dr. Peter Hill about SuperFictions, the Situationist-style blurring of fact and fiction as a subversive art-form. To our process, some visitors expressed bemusement by what resembled a House of Bedlam. But it largely depended on what moment in time across the day or week people came as to how they experienced it. Daily, knowledges were assembled then dismantled as HoW members negotiated the gallery space, artefacts, affective research, visitors and each other, sometimes in a process resembling consensus decision making. We interrogated how in a time of insecure work and corroded community, it suits the ends of neoliberalism for us to believe there is something wrong with us as individuals, that only a new ‘Shakeweight’ or neuro-linguistic DVD set can resolve. Working collaboratively in our making and curation also dispelled the master superstition that we are each alone. However, when so many of us are accustomed to atomised culture, collaboration can provoke great friction, so it was not always pretty. But it sure was beautiful. As an artist/researcher, Arab Jew, and child survivor of self-improvement, both HoWs continue to inspire me. For our last curation in the HoW, we consensed to elevate all self-improvement artefacts to the top of a dividing wall appropriated as a plinth, not as an illuminated conclusion but rather as a crepuscular, liminal storage measure. However, given HoW’s critiques of transcendence discourses implicit in self-improvement, perhaps our conditioning ambushed us here in this move to elevate. Or did we become enlightened? Future HoWs may speculate, should they recur. Long live the House of Wisdom!